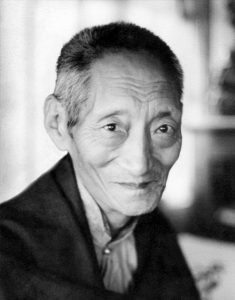 Vajradhara Kalu Rinpoché was born in 1905 in Horkok valley (Kham province, eastern Tibet). His father, the thirteenth incarnation of Ratak Palsang Tülku was an accomplished Yogi and famous Doctor. 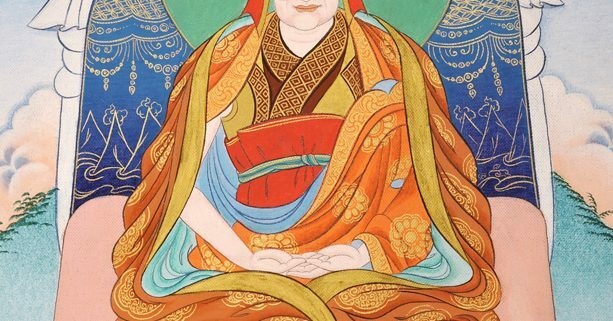 His mother Drölkar devoted to Dharma from an early age completed one hundred million recitations of the Vajra Guru mantra, two hundred million Mani’s, and one hundred million Vajrasattva mantras. Both Kalu Rinpoche’s parents were direct disciples of the initiators of the non-sectarian (Rime) movement, which emphasized the common ground of the Tibetan Buddhist Lineages; Jamgön Kongtrül Lodrö Thayé, Jamyang Khyentsé Wangpo and Mipham Rinpoché. When Rinpoché was born, above his house brilliant rainbows formed and snow fell gently like a rain of flowers. His mother and relatives described how, as soon as he was born, he looked around and smiled radiantly, showing no fear or shyness, and he spoke the Six-Syllable Mantra. His parents and everyone in the region were full of joy, and his birth was heralded as the birth of a very wonderful incarnation. As a child, noble virtuous tendencies stirred within him and noble innate propensities for compassion and devotion arouse naturally. His compassion for sentient beings would often move him to tears, particularly for those afflicted and oppressed by suffering. Kalu Rinpoché was recognized as the activity emanation of Jamgön Kongtrül but his father refused to give him up to the monastery and instead trained his son in buddhist studies and medicine. Because his father worked enthusiastically at his own practice of daily recitations, meditations, and retreats, Kalu Rinpoche endowed with a good intellect, also had to rise early and retire late, his days filled with meditation, practice and training. At the age of thirteen, the eleventh Tai-Situ, Padma Wangchuk, gave him ordination and the name Karma Rangjung Künchab – Self-Arisen and All-Pervading. In later years, everyone said that it was an appropriate name. When Kalu Rinpoché was fifteen he went to Palpung Monastery where he mastered the vast body of buddhist teachings and completed two traditional three-year retreats. 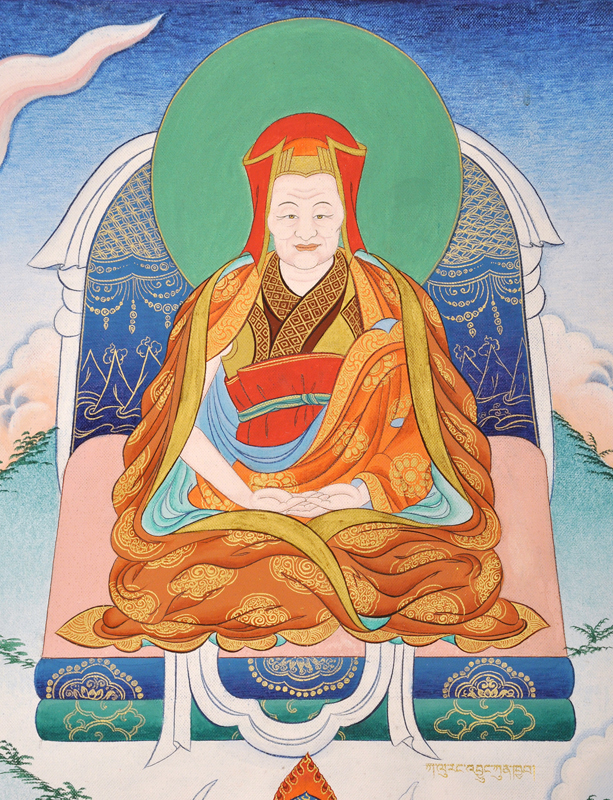 Kalu Rinpoche had great faith and devotion to the lamas with whom he formed a connection receiving from them empowerments, which mature one spiritually, and teachings, which enable one to attain liberation. Before entering his first three-year retreat he spoke on the three ordinations before an assembly of hundreds of monks, nuns, and lay people. Because he spoke with no fear, with confidence and a sound understanding, his exposition captured the hearts of everyone. People commented on his clear intellect, good delivery, and accurate presentation. Kalu Rinpoche too k White Tara and Avalokiteshvara as his yidams and the age of fifteen and undertook a summer retreat. At the age of sixteen, he entered the three-year retreat at Tsadra Rinchen Drak, the main seat of Jamgön Kongtrül whose coming had been foretold by the Buddha in many sutras and tantras. At this time, his faith in his lamas and the Dharma and his enthusiasm for practice knew no limit. Some idea of Rinpoché’s enthusiasm for Dharma may be gained from his determination to avoid any waste of time during the three-year retreat. To ensure that he would wake up in the morning, he would go to sleep leaning against the door to his room. Thus when the monk kicked open the doors to the rooms to wake up the retreatants in the morning, Rinpoché was sent flying across his room. If he felt sleepy during the day, he sat on his window ledge. In this position he would fall onto the floor as soon as he dozed off. As for his faith, Rinpoché felt such devotion for his teacher, Lama Norbu Töndrub, that during his life, he offered everything he owned to him on three separate occasions. 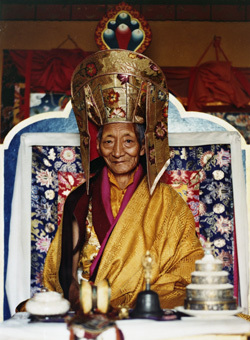 Kalu Rinpoche became a lineage holder for the Shangpa and Karma Kagyü traditions and studied with many learned and accomplished masters of all the lineages of Tibetan Buddhism: the 16th Karmapa, the eleventh Tai-Situ Rinpoché, Padma Wangchuk, Palpung Khyentsé Shenpen Özer, the fifth Dzogchen Rinpoché (abbot of the major Nyingma monastery in Eastern Tibet), Khyentsé Chökyi Lodrö, Düdjom Rinpoché, His Holiness the Dalai Lama, the two tutors of the Dalai Lama (Ling Rinpoché and Trijang Rinpoché), Dilgo Khyentsé Rinpoché (the mind emanation of Khyentsé Wangpo), Kangyur Rinpoché, Chatral Rinpoché Songjay Dorjé, Sakya Trichen (head of one of the two principal families of the Sakya School), Deshung Rinpoche (senior scholar of the Sakya School), and others. With these outstanding lamas, Rinpoché continually worked diligently at studying, contemplating, meditation, and practicing innumerable collections of instructions from both the sutras and tantras of the Old and New Traditions. Through his endeavors he became like a spiritual son to all of them. At the age of 25 he renounced all worldly activity and began approximately 15 years of intensive solitary retreat in the remote mountainous areas in the manor of the great Tibetan Yogi Milarépa. Upon the request of the Karmapa he returned to become a retreat master, training many students. In 1962 Kalu Rinpoché went to Darjeeling West Bengal India where he established his own monastery and retreat center, Samdrup Darjay Chöling Monastery where students from any tradition may do retreat practices in the Rimay Tradition. Upon the request of his Holiness the 16th Karmapa, Kalu Rinpoche made his first of many trips to the West in 1971, stopping to visit Holy sites in Jerusalem then visiting Pope Paul VI at the Vatican. Kalu Rinpoché respected all of the world’s religions and spiritual traditions. During his life he made numerous trips around the world, establishing a large number of Meditation and Retreat Centers. Through his unceasing love and compassion he turned the great wheel of the Precious Buddha Dharma worldwide benefiting countless beings. The Venerable Dorjé Chang Kalu Rinpoché passed into parinirvana at his monastery in Sonada, Darjeeling India on May the 10th 1989. The Holy Lama’s body showed no signs of corruption and has been preserved as a Kardung, which can be seen to this day at his Monastery Samdrup Darjay Choling in Sonada. His devoted disciple and heart son, Bokar Rinpoché wrote about Kalu Rinpoché “The gentleness of his being, the pervasiveness of his kindness, the brilliance of his wisdom and his irresistible sense of humor has touched hearts in every part of the world”. From his humble beginnings in a remote location in Eastern Tibet, to a citizen of the world The Venerable Kalu Rinpoché sought only to benefit others. Through his enlightened activity countless beings have been set firmly on the liberation path. After Kalu Rinpoche passed away in 1989, his tülku Yangsi Kalu Rinpoche (born in 1990) was officially recognized, on March 25, 1992, by Kenting Chamgön Tai Situpa as the son of Lama Gyaltsen, Rinpoche’s nephew and life time assistant, and his wife Drölkar. The young boy was born on September 17, 1990, at Samdrub Darjay Choling Monastery in Sonada, India. He inherited of f the monasteries of Sonada and Salugara and has started to be a current holder of Vajaradhara Kalu Rangjung Künchab’s lineage. In accordance with the Shangpa Kagyü lineage yogic transmission, from master to disciple, the other current holders are the Rinpoches and Lamas disciples of Kalu Dorje Chang who were entrusted by him.